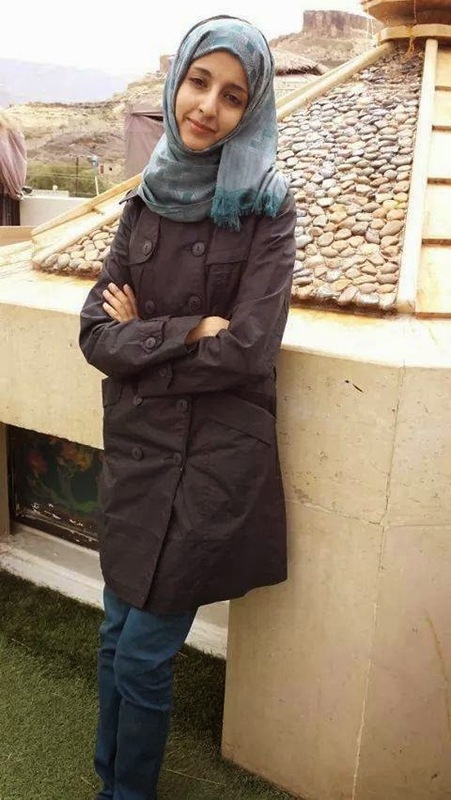 Heba Al-Thabhani, a college student at Sana'a University started a storm of resistance to Al Houthis' hegemony of the university's campus since she was assaulted and threatened to be stripped off by Al Houthi men, on the 2nd of December. The current typical dress code for women in most of Yemen's big cities, including Sana'a is to wear a long black dress with long sleeve, usually called "Baltoh" (like a maxi dress) that covers the entire body. There are a handful of women who don't wear the Baltoh. And Heba decided to join the exception by wearing a modest jacket along with a trouser. Then, as she was going to her university, her unusual appearance provoked Al Houthi armed men who have been occupying the campus in the wake of their takeover of Sana'a city, on 21st September (an update!). Heba was interrogated by the armed men and asked to abide to the typical dress code for females in the city. As she refused to be submissive, she was threatened to be stripped off her trouser. It's not certain if they would have really done so, but it's certain that they wanted to scare her and terrorize her. Al Houthi are religiously strict group and Heba's dress definitely doesn't go in accordance with their religious considerations. Heba refused to be scared and she decided to speak out following that incident. Once she spoke out, her story took local press and social media networks in the country by storm. More importantly, her issue grabbed massive students' movement inside the university's campus, in solidarity with her and in protest against the Houthis' armed occupation of the campus. "Awhile ago, I was stopped by three armed men inside the university campus. And they objected on they way I dressed. Of course, I told them that was none of their businesses. Because they had an armed group of men, they went on saying if you don't wear along Baltoh & cover yourself, in slang, they said we will take off your trouser. That meant that they threatened to strip me off from my clothes. This I will not accept and neither the society will accept. I tried to ignore them and continued walking away. Afterwards, they sent me a male college student from the mass communication college; he delivered their message to me: "if I don't wear a long Baltoh, I would be banned from entering the university. At that moment, I felt that I should not be silent and that I have to speak out. We demand forcing the armed militias out of the Sana'a university and to appoint a civil guards group to supervise the university. Yes, sure, there is fear, my cause might be exploited by some political forces and I can get harmed directly or indirectly.. but that doesn't mean that I will be silenced just because I am scared. We must continue and resist and speak out!"